including one that is truly perfect for you! 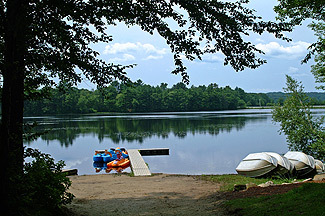 Stateline Campresort is a full amenity outdoor resort located on the beautifully wooded shoreline of a private lake in the “Quiet Corner” of Connecticut, right on the Rhode Island state line. Our main lodge houses an all-ages entertainment center, adult lounge, camp store, laundry facilities, Internet access, and more. Adjoining the main lodge is our new open pavilion, which, in turn, is overlooked by a spectacular swimming pool and patio complex. Stateline Campresort features spacious campsites which will suit the needs and interests of the full range of campers … from tenters to folks traveling in the biggest of big rigs. 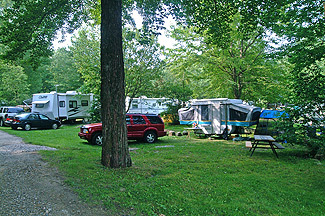 Available site amenities include 50-amp electric service, sewer hookups (or honey wagon service), and sites for seasonal and long-term stays. Map by Lloyd Gevry, Graphic Designer. a larger, high-resolution version in PDF format. Please Read These Guidelines Before Camping. All Rules Are Strictly Enforced. Violations Will Result in Expulsion Without Notice or Refund. (1) All members, visitors and guests must be registered in the office and car and RV passes must be displayed at all times when in the park. This is a security patrolled park. (2) All campfires must be extinguished by midnight. Accordingly, campers found neglecting this policy will be ejected from the park immediately without refund! Campfires are allowed only in designated fireplaces. We do not allow outside firewood to be brought into the park; firewood is available at the office. Fires are not to exceed a 3 ft. maximum. The cutting of vegetation is prohibited. Fireplaces must be cleaned prior to departure – subject to $25.00 fine. No stockpiling of wood allowed. (3) Our quiet hours are: Sunday thru Thursday, from 10:00 PM to 8:00 AM; Friday and Saturday, from 11:00 PM to 8:00 AM. These hours are strictly enforced. All camp buildings will be locked 15 minutes before quiet hour unless special permission is given by park manager. If you are entering the park after quiet hour, do not disturb your sleeping neighbors. No excessive idling of engines is allowed in the park. (4) One vehicle is allowed per site, and 1 tow vehicle. Additional vehicles may be left in the parking area near the main building. Parking is not allowed on the road or on unoccupied sites. You are allowed one RV and one tent or two tents per site. No more than 8 people may occupy a site. (5) There is no trash pickup in the park. Please use the dumpsters for refuse. (6) To protect our trees, nothing is to be tied, nailed or bungee corded to the trees, with the exception of a hammock which must be hung on your site with a hammock strap only. (7) Pets must be leashed at all times. Transient campers may not bring Pit Bulls, Rottweilers, Terrier Mixes, or any other aggressive breeds of dogs. Please call our office prior to bringing your pet, if you are uncertain about this restriction. Pet restrictions will be reviewed on a case-by-case basis with seasonal campers. All campers must clean up after their pet(s). Pet(s) must be kept very quiet and not be left unattended. Pet(s) are not allowed in common areas (i.e., pavilion, pool). Use of puppy park is free. Please be respectful and clean up after your pet. Water also available. (9) No waste water is to be drained onto the ground. (CT state law). (10) Children 17 or under must be on their site by 11:00 PM unless supervised by someone over the age of 21. Parents will at all times be fully responsible for the conduct of their children on the park premises. Parents will be responsible for destruction of park property by their children. Children 17 and under may not be left in the park unattended. Children under the age of 6 may not leave site unless supervised by someone over the age of 12. (11) Check-out is at 11:00 AM. Check-in is between 3:00 PM and 9:00 PM. Early arrival, late check-in or check-out will constitute an additional fee. Permission and payment must be obtained in advance from the office. (12) Phone messages will be delivered to individual sites in emergencies only. (13) Motorcycles are only allowed in the park when riding directly to and from site. (14) There are no lifeguards on duty at the pool. Parents and/or guardian are required to supervise their children when at the pool or at the lake. No one under the age of 13 is allowed in the pool or at the lake without a parent or guardian (18+). Any infraction of rules will result in suspension of use. No running or horseplay at the pool. No suntan lotion is allowed in the pool. No glass containers are allowed in pool area. Bathers must shower prior to entering pool. (CT state law). There is NO SWIMMING in our lake, only excellent fishing and boating. (15) All bikes, scooters, etc. must be back on site at dusk. Any child under the age of 16 must wear a helmet in the park at all times. (CT state law.) No electric or gas or battery operated ride on toys or equipment other than property of Stateline. No hoverboards. No drones over campsites or pool. (16) All party lights must be turned off at 11:00 PM unless special permission is granted by management. (17) Under no circumstances are you allowed to operate an unregistered vehicle and/or equipment. Registered vehicles must be operated by a State Licensed Driver. NO PERMITS! (18) Excessive use of alcoholic beverages is not tolerated. Up to and including any recreational drugs. Authorities will be notified. No kegs. NO firearms. NO electric heaters. NO propane firepits or patio heaters. (19) Basic electric is included on any standard, premium, premium deluxe sites as well as cabins, this does not include excessive use. We require that AC & heat be turned off when not at your site; fans appreciated. For example, if you’re up at the pool, AC doesn’t need to be at 65.